On December 3rd, from 1-5pm, I will lead you through an Intentional Creativity process in which you will gather the bones of your life that represent the dead and dismembered parts of yourself and bring them back to life by singing over them (figuratively and/or literally) . What will happen then is mystery. You will paint, journal and integrate on a deeper level the teachings from the previous weeks and receive new insights from The One Who Knows, La Loba. 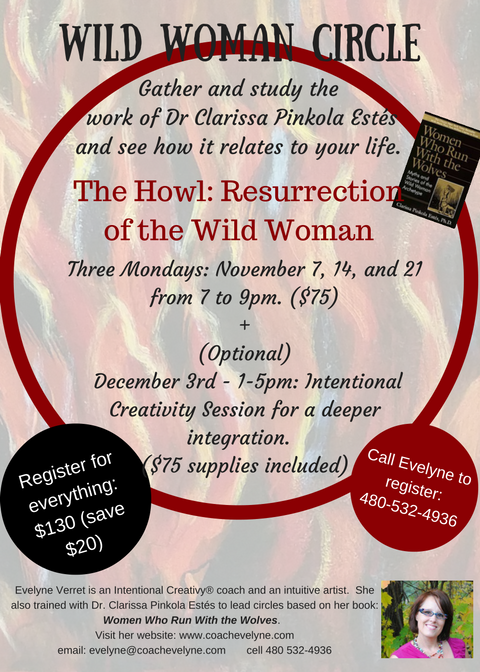 This first chapter is about resurrecting the Wild Woman within... can you stand it? Are you ready to find the dead and dismembered parts of yourself and bring them back to life? Are you ready to find your own soul song? Come, let's begin!